Your wedding is different from every other wedding, and using the same script for every wedding just doesn’t work. DJs just play music, and while most MCs will make announcements, we can bring so much more to your reception. Our Wedding Hosts will work with you to set the perfect tome for your reception. The things that worked at your friends reception may not work at yours. It takes some Hosts years to learn it and some companies have yet to learn it. Even if you have seen our Hosts at more than one event, we always start your event with a fresh approach. Mike has been a wedding host for over 15 years. His combination of DJ and Hosting skills has made him one of the most popular hosts in Temecula and Orange County. He is one of, if not arguably one of the best MCs in the business. He honed his skills with a background in acting and public speaking, and combined that with his love of music. He has the unique ability to be as interactive as he needs to be, but can put the mic away and serve as a club style beat mixing DJ. 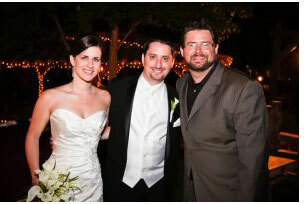 Mike has worked hundreds of weddings in his time and before moving to the Temecula Valley was one of the preferred hosts for Disney’s Fairytale Weddings. In his many years of experience he has hand trained many of the DJs that work for other companies. Mike is an active member of many professional and community organizations. He is member of the Business Spotlight Committee for Temecula Valley Wedding Professionals, as well as a member of the Association of Bridal Consultants (ABC) – Inland Empire Steering Committee as well as an active member of the ABC Orange County chapter, where he was a nominee for the prestigious Trendsetter Award. Besides weddings, Mike enjoys College Football, Hockey, Baseball and just about every other sport. While a new member of the C Squared Events family, Josh has been DJing for over seven years. Staring in 2007, has performed hundreds of events. Josh has a genuine nature and cares about the success of every event he performs at. Josh has performed just about every type of event in the business and while he loves weddings he also enjoys, Mitzvahs, quinceañeras, corporate events and well just about anything that allows him to use his talents to make people happy. Josh has a strong theater background. Call, email or text us today to set see what C Squared Events can Bring to Your Event!